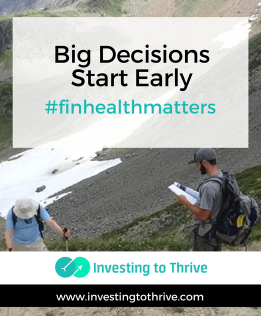 This blog post celebrates #FinHealthMatters (financial health matters) sponsored by the Center for Financial Services Innovation (CFSI). As a parent, I want to teach my kids to make their own decisions: smart ones, as much as possible; and if not, ones from which they can recover emotionally, physically, and financially. This decision-making scenario is ideal. But I'm not sure if it's possible. The line separating teachable risks from dangerous ones is not clear and predictable. My longing to empower them with wisdom often conflicts with the parental need to protect them from making poor, life-altering choices. What does decision making have to do with financial health and student financial health? I believe that the more students (like my kids, a college junior in aerospace engineering and a recent college graduate in public policy and economics) can own the consequences of their choices, financial and otherwise, the more likely they'll become and remain financially healthy. Finances alone shouldn't drive decisions. But decisions carry financial implications and these ought to be acknowledged and considered. I'll insert here that I find myself in a fortunate position to have choices and grown children who also have choices. Many students and college-aged adults have few options, not as a result of personal decisions but stemming from difficult family finances, limited economic opportunities in their hometowns and home countries, and other issues. In addition, I should mention that I don't think that pursuing a career with the biggest paycheck or the most secure future is the only way or the best way to become financially healthy. Many of my youngest son's friends (still in college) have indicated to him that they plan to take the post-graduation position that pays the most. In a recent conversation, my son asked my husband (his dad) and me how we chose what position to take. Uh, well, we didn't have choices exactly. We didn't choose between one juicy job offer and another. Instead, we snatched the first job that came our respective ways, months after college graduation during a period of high unemployment. Through this conversation and others like them, I've realized that, intuitively, I link decisions with financial consequences, whether there are many desirable choices or just a single good one. Getting my kids to this place — where finances inform but don't dictate — puts them on the path to good financial health. To me, good financial health is being in control of your financial situation, understanding how choices made today may affect the future. One of my jobs as a parent has been to frame choices in terms of potential outcomes as well as financial costs and benefits. When kids are in college, and even before they graduate from high school, they make choices with potential for long-lasting impact. Often, paths are attached to weighty financial decisions without us (parent or student) realizing what's happening. Should I pursue an interest that could lead to a scholarship? How much time will this interest take? How much money will I (or my parents) need to spend for equipment, lessons, competitions, and travel associated with this interest? Will the scholarship help me meet my career goals, personal goals, and financial goals or will it detract from these goals? Will I be happy that I pursued this interest even if I don't win a scholarship? Should I take electives in subjects that interest me or courses that may boost my GPA and make me attractive for scholarships or college admissions? Are there courses that both interest me and make me attractive or should I be thinking more about learning for the sake of learning? Should I take AP classes? Should I attend early college as a way of finishing high school and getting an early start in earning a college degree? Will either of these paths help me mature more quickly and get me into graduate school or the job market faster? Will these classes transfer to my chosen college and my course of study? Should I apply to a public college or university in my home state or another state, or should I apply to a private college or university? Are there special programs or opportunities at any of these colleges or universities that will position me well for my career? How do the costs compare among my choices? Should I go to a community college and learn a trade rather than pursuing a bachelor's degree? Will this approach mean higher earnings and less student debt? Should I pursue a career in the military and if so, should I enlist after high school, pursue an appointment at a military academy, or attempt to enter officer's training school after college graduation? What other choices could I consider? Should I decide on my career before going to college? What major should I choose? Should I pursue what I love, what my parents want me to do, what will make it easier to get into grad school, what's likely but not guaranteed to give me a good-paying job after college, what's likely but not guaranteed to be in demand the year I graduate and the years and decades to come? Is there anyway I could combine all these wants into one major or a double major? Should I take out student loans? Is there another way to pay my expenses? Should I work while in school? Will I have time to work and excel in my studies and enjoy college life? Should I concern myself with enjoying college life or just getting a degree? Will this job help pay the bills or will working lead to more expenses, such as more outside meals to accommodate my schedule? Will this job look good on my resume? Will future employers be more impressed by my work ethic or excellent grades? Should I get a credit card? Will a credit card help me to build good credit or ruin me with out-of-control balances? How students navigate these choices, as well as smaller ones like whether to bring a bag lunch or eat at the dining hall, shape their financial health today and for years to come. As a parent, I want to guide my kids, no matter what age they are. But if I advise too heavily, how will they hone their decision making abilities? Further, what else might they learn if they take a different path than the one that seems clearly superior to me? When I was in college, I worked as a resident advisor for the department of housing. Even though I majored in business with a concentration in finance, one of my biggest financial and life lessons came from the housing work. A full-time staff member there had become financially independent through investing, an example that stuck with me for years. Our paths crossed in the 80s, well before the popularity of the FIRE movement (financial independence/retire early), Roth IRAs, discount brokerage firms, and index funds. I have knowledge and experience to help kids make smart decisions. But I don't know everything. And I can't teach them to learn from their decisions unless they make choices on their own. Many parents can anticipate problems before a student does. But that doesn't mean we need to stop problems from happening. chooses a major that won't lead to a high-paying career and requires a simple lifestyle? decides that his best path is to launch a business but doesn't have seed money? commits to making a social impact in an area with a high cost of living? Could I or should I step in to help? Will helping with some cash or offering to pay for certain expenses enable a student or young adult to reach his goals? Will footing the bill, part or all, ruin both his financial health and mine? If there's always a stream of money that rescues them from a bad decision, financial health won't happen. But are there situations in which financial support is warranted? What I've learned is … it's hard to be a parent. Discerning the exact line where helping becomes hurting, where an extra $20 quickly becomes an extra $2,000, where a well-meaning gesture muddles the decision-making process. A better plan, I've discovered, is to show how compound interest works, how to calculate the cost of student loans, and how stock market ups and downs aren't to be feared. Sometimes we need to learn these lessons ourselves first, before we can teach our kids. But what we know, we should share — whether it's a story or a spreadsheet. It'll become clear when they're on the path to financial well-being. They begin to feel emotional pain, not just a financial pinch, at the apartment moving estimate; and they'll call a buddy who has a pick-up truck and a strong back instead. They'll discover good friends who become great roommates at a fair price. They'll weigh the cost of switching plane tickets with a layover in a high-priced city … all without parental interference. Students can become financially healthy when they're armed with the tools to make smart decisions with their money.